Despite a few small quibbles, the lightweight and foldable Parrot ANAFI is an extremely compelling addition to the camera drone arena and a better-equipped product than anything else in its immediate price band. Flight time is exemplary, the drone is near silent in flight and you’ll love the amazing camera and zoom. 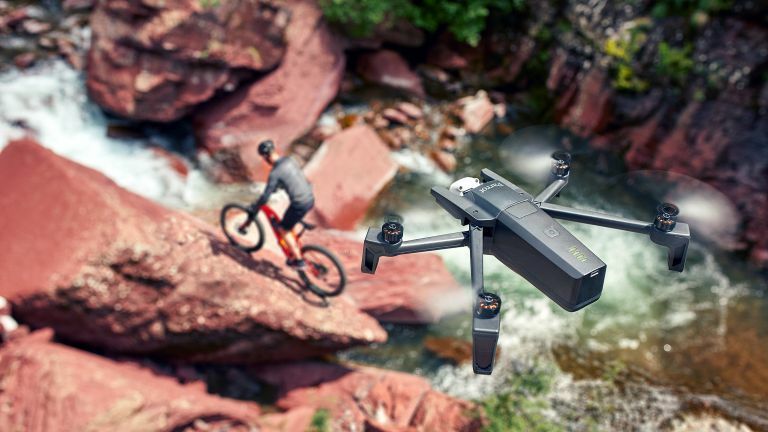 Several drone manufacturers – 3D Robotics, GoPro, Yuneec, Hubsan, Walkera, etc – have already tried to develop viable alternatives to DJI’s rock-steady fleet of consumer-based camera drones, led by the Mavic Air. All failed. It shouldn’t surprise anyone, then, that Paris-based Parrot – Europe’s biggest drone manufacturer – should be the first to take DJI head on and come very close to matching it. After all, this is the company that pretty much single-handedly started the whole consumer drone trend when it launched its popular AR Drone way back in 2010. Its follow-up, the Bebop, was equally impressive, but even this lightweight and eminently useable budget bird couldn’t compete against the rise of DJI and its squadron of impeccable camera-carrying Phantoms and Mavics. So, back to the drawing board they went, and the ANAFI is the outstanding result. This aircraft is roughly £139 cheaper than its nearest rival the DJI Mavic Air and yet it boasts almost as much groundbreaking tech in a portable package that’s nearly as confidence inspiring to fly. At just 320g, the ANAFI is one of the lightest camera-equipped drones on the market and that’s a major benefit should it ever fall out of the sky, since it is less likely to sustain major damage. In theory, anyway. The ANAFI easily collapses for easy transport by simply folding in its four arms. However, its 244mm length when collapsed makes it impossible to pop in a pocket. Just as well, then, that it comes in a slim cloth-covered transport case that easily fits into a small shoulder bag. Despite looking like a giant mosquito, the ANAFI was actually inspired by the humble bee. Accordingly, it has its three-axis gimbal and camera mounted directly in front of the drone, sort of like a head. This means the props will never appear in shot when the drone is moving forward at high speed. It also means the camera can be pointed 90˚ upwards for a unique perspective that no other drone offers. The ANAFI’s microSD card slot, meanwhile, is situated just under the battery in a compartment that looks like a sim slot for an old Nokia phone, but is easier to remove. Side by side with the Mavic Air, the Parrot ANAFI looks much more like a toy and unflatteringly insect-like. But once in the air it takes on the familiar drone shape we’ve all come to love (or dislike, depending on which side of the fence you are). What’s this craft actually like to fly? Very good it must be said, though it’s still not quite as confidence inspiring as the Mavic Air. It doesn’t have any obstacle avoidance for a start, losing quite a few points to the Mavic Air in that respect (obstacle avoidance is something you will almost certainly miss if using the ANAFI’s autonomous modes in obstacle-littered situations). Once in flight, the ANAFI is extremely easy to control and is very stable, even in a stiff breeze. The first firmware version we tested did present a few anomalies – including wi-fi signal and GPS loss – but these have been rectified with the latest update. The drone boasts an excellent 2.4 mile range limit but bear in mind that no drone should ever be flown further than line of sight. It’s the law, mister. Prop noise is one of the main factors that puts people off flying drones in public spaces – the loud bee-like sound they make always attracts attention, sometimes of the wrong kind. But not this little fella. In fact, the ANAFI is so remarkably quiet you can hardly hear a thing while it’s hovering only a few metres above your head. This is one of the ANAFI’s major advantages over other drones. At 33mph, it’s also quite sprightly, but only when in Sport mode. As you’d expect from a modern GPS-equipped drone, the ANAFI also features Geo fencing, smart return-to-home and a Find My Drone function that geolocates the drone while it emits a beep. This is where the ANAFI really shines and a good thing too, since the whole purpose of these drones is to shoot high-quality video and stills. Having tested it in the field (as it were), both video and photo quality seem on par with the Mavic Air and in low light shooting it’s actually a bit better. It doesn’t offer as high a frame rate as the Mavic Air (30fps in 4K vs the Mavic Air’s 60fps in 2.7K) but the 4K video and 21 megapixel images its 1/2.4-inch Sony CMOS sensor produces are tack sharp, with excellent detail and rich contrast. The camera also supports HDR (High Density Range) shooting and Adobe DNG/RAW formats for more efficient post-production editing. Rare for a consumer drone, the ANAFI’s camera also features 2.8x lossless zoom, which works amazingly well with no discernible loss in image quality. Granted, you can always replicate a zoom effect in post production (especially if shooting in 4K) but having it on board can be a really creative tool. The ANAFI’s camera gimbal (the mechanism that holds the camera stable no matter what the drone is doing) features two mechanical roll and tilt axes and a digital panning axis. We’re not convinced a digital axis is as smooth as an all-mechanical gimbal like that fitted to the Mavic Air, but so far we haven’t noticed anything untoward with the footage we’ve shot. One thing we have noticed is that the ANAFI controller’s gimbal rocker switch is nothing like as tactile as the Mavic Air’s finger wheel. This makes slow, gentle tilting of the gimbal extremely tricky and we hope that Parrot includes a means to adjust gimbal characteristics in a future update. Another great highlight with the ANAFI is that its camera and gimbal are situated at the front of the drone, mostly out of harm’s way. This also means the camera can be pointed 90˚ upwards to capture subjects from below. It’s not something you’ll use very often but it’s great to know the feature’s there. Like the Mavic Air, the ANAFI also provides a host of excellent automated flight modes – Follow Me, Boomerang, SmartDronie, etc – including one amazingly smart feature that uses the camera’s zoom facility to superb effect. It’s called Dolly Zoom and what it does is create director Alfred Hitchcock’s famous ‘Vertigo’ effect (also used in the film ‘Jaws’) where the subject being shot remains the same size in the frame as the background zooms in behind it. You can create this unusual wrap-around effect to some degree in post-production editing, but it’s still a fantastic feature to have on board. Dolly Zoom works best when used against a striking background like a mountain range or an imposing building. Cameraman is another cool feature that hands flight controls over to the pilot while the camera remains pointed at the main subject. This is a great option to select if shooting a static subject with an upwards or downwards motion since the gimbal will automatically tilt at a more gentle pace than is possible using the controller’s clunky rocker-arm setup. Other flight modes include Hyperlapse (moving time lapse) and Slow-Motion. However, the remaining functions like Follow Me and Touch&Fly are locked and require an in-app purchase which is frankly having a laugh. Once you’ve forked out this much, every app-based function should be included in the price and charging a heap extra (about £14.99) will only lose Parrot a lot of friends. These days, any consumer drone worth its salts must integrate seamlessly with an Android or iOS device and this one does it superbly well. The new Parrot FreeFlight 6 app is very well designed and really easy to follow. Granted, it doesn’t allow for as many camera, flight and gimbal tweaks as the DJI Go 4 app, but it’s perfectly acceptable for first-time users. The HD image quality streaming from drone to phone is impressive, though we did experience a few visual glitches and some pretty poor lag from time to time. The hand controller is built like a brick outhouse and feels a lot heavier than the drone it controls. It’s certainly too bulky for a pocket and pretty sparse on the button front, too. Aside from the ‘take off’ and obligatory ‘return to home’ buttons, it comes with two index finger buttons on the rear – one for taking images and video and the other for resetting the gimbal and optics – plus two rocker arms for gimbal tilt and camera zoom. Its phone cradle will accommodate anything up to an iPhone Plus. Being able to charge your drone’s battery via USB-C should be considered a major plus given that we all have access to a portable powerbank. However, in this instance it’s completely spoiled by the woefully long charging times. With powered USB it’s not too bad at 105 minutes, but plug it into a wall socket adaptor and the charging time extends to over three hours – it’s even worse if using a computer port. Also, the battery switches on far too easily – just a simple tap will suffice. On the plus side, the battery provides up to 25 minutes of flying time (five more minutes than the Mavic Air) and that’s a massive bonus. It’s too early to say how reliable this smart camera drone is in the long term but there’s no doubting that Parrot has pulled off a major doozy with pretty much every element of the ANAFI. It flies exceptionally well, it’s got a stonking camera on board and its accompanying app is a doddle to navigate. Granted, the jury’s out on the gimbal’s digital panning axis but so far it's produced footage every bit as good as the DJI Mavic Air. However, we just don’t like the clunky gimbal rocker on the hand controller and we definitely miss having obstacle avoidance sensors. For this writer, the ANAFI isn’t quite up to the benchmark set by the DJI Mavic Air, which is still far and away the best drone in the sub-£1,000 price band. However, it’s definitely a better equipped product than the cheaper DJI Spark, and Parrot's competitive pricing should mean it does very well – and deservedly so.